It is no secret that I am a huge fan of TOMS, a really unique brand that has inspired much of my own ‘fashion for good’ conservation work over the years. With giving at its core, TOMS fantastically matches every pair of shoes purchased with a pair of shoes for someone in need. To date, this brilliant ‘One for One’ mission has seen over 75 million new pairs of shoes given to those in need around the world, with over 1/3rd of those shoes being produced in the regions where they are distributed, including back in Kenya. This season, TOMS has introduced a selection of boots, ones that not only look great (with, as I found out, EVERYTHING you pair them with), but like all other TOMS products, they also give back; It’s a win, win! 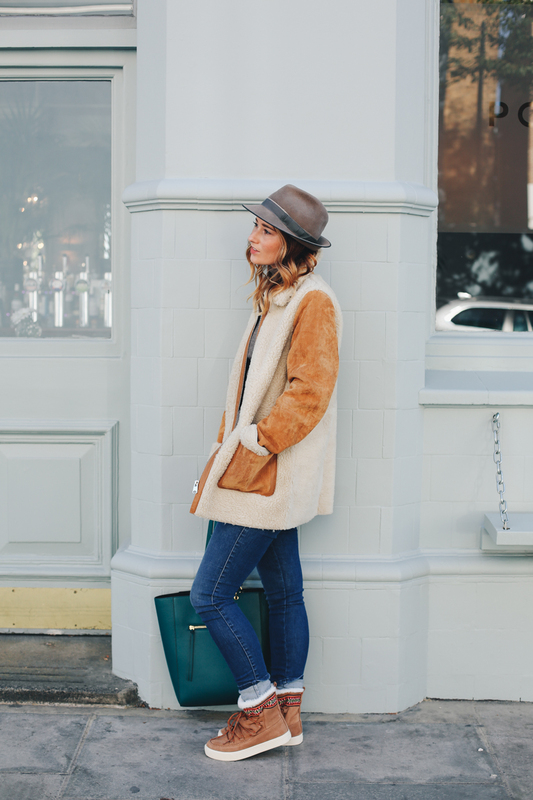 Instead of going dark, like the rest of my usual winter boots, I chose to wear the Ella Booties in Desert Taupe Suede Metallic (RRP. £89.00). 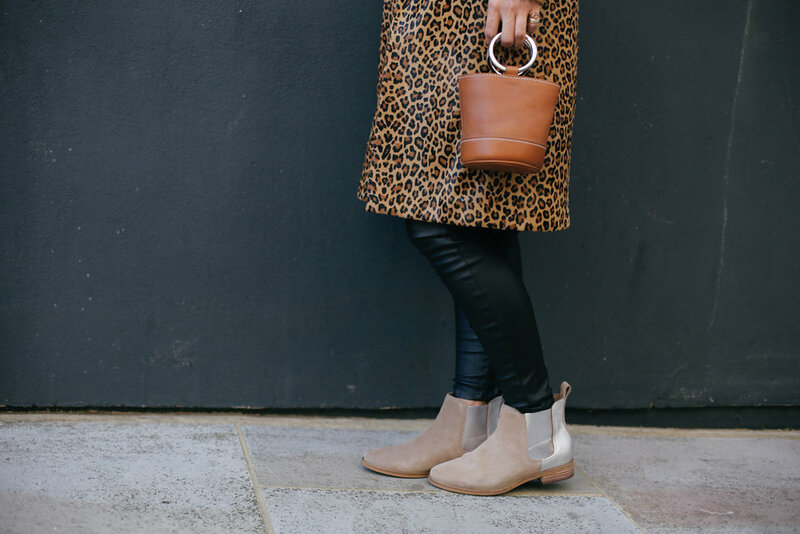 A favourite of Queen Victoria, the timeless Chelsea Boot style, characterised by it’s high-top, slip-on design, and inherent simplicity, are the easiest of silhouettes to wear. The light colour of these boots makes them really inter-seasonal, and the inclusion of the metallic, makes the feel both modern and fresh. These boots conveniently work with every outfit I throw together and look set to be pretty hardworking additions to my wardrobe! Not all heroes wear capes. But some do. In their TOMS. I’m never usually too far from some leopard print, and in this case Britney and Justin, I will take your Double Denim and I will RAISE YA! Yup, I went Double Leopard, all black everything else, with my Ella Booties balancing the outfit. Gloves, socks and a beanie will be merry additions as it gets colder. I love winter whites on a bright, cold day, and the combination of my Liz Hurley’s (a.k.a. 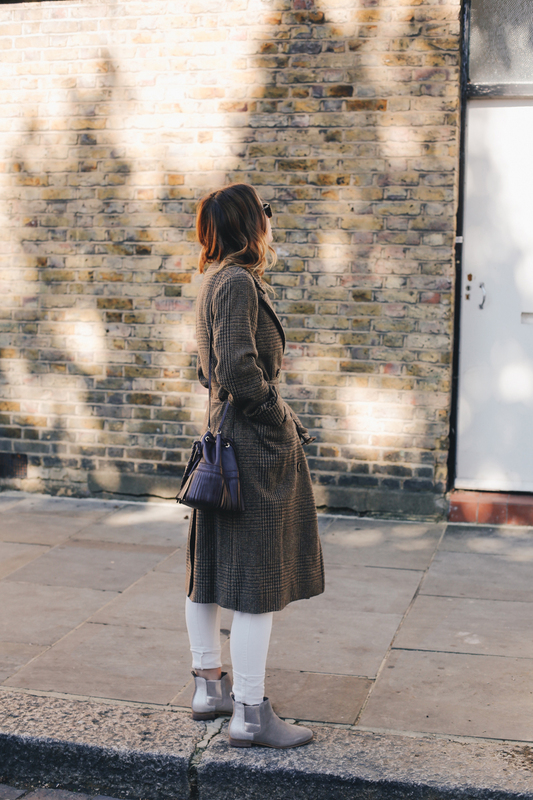 my white jeans) and sandy Ella Boots, mixed with some textured tweed and a darker polo neck led to one of my favourite looks of the day which I will certainly be replicating. 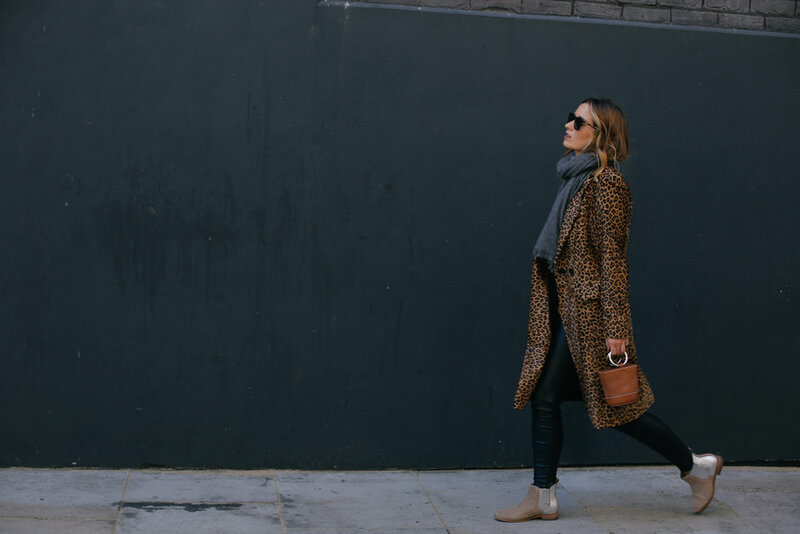 I mean, just when you thought I couldn’t possibly throw any more leopard your way… A statement coat like this can always do the talking, so I just had to rely on my neutral Ella’s to do all the walking. And in case you were wondering, no, that teeny bag doesn’t fit a thing… But that’s not really the point now, is it?! #Fashion. I also chose a pair of Toffee Suede Alpine Boots (RRP. £84.99) which literally put the fun into functional. 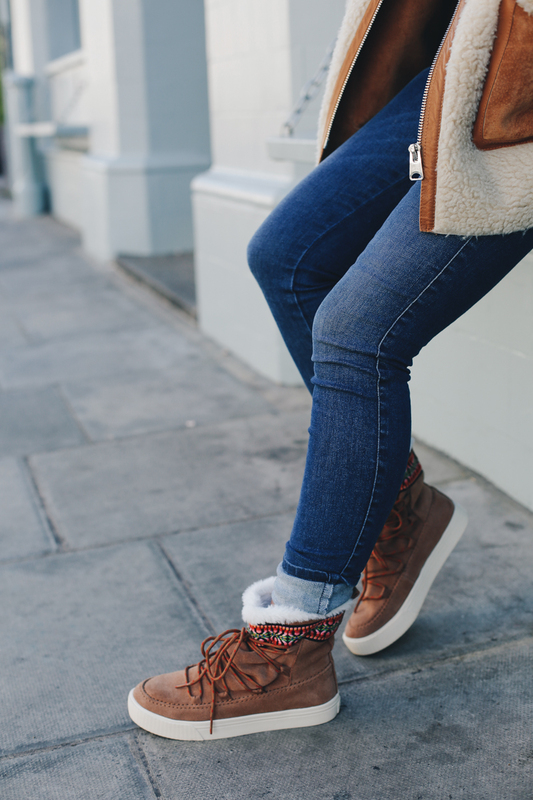 The boots are everything you crucially need for a bitter winter, without having to sacrifice your style in exchange for keeping warm. Despite being water resistant, and promising to keep those tootsies snug-as-a-bug, the bold pattern they feature is sprightly. These will be exactly what I need to keep myself distractedly cheerful, whilst tackling the impending street slush in the next few, darker months! Having the sweetest tooth known to man, the whole toffee’ness of this outfit appeals hugely. Not only do the Alpine Boots stop my jacket from feeling too Frank Butcher, I love how my (*epic) bag highlights their coloured details. This look is definitely one I’ll be enjoying during The Big Chill. All the layers of this outfit, along with the wool of the Alpine Boots poking out, immediately makes me feel cosy and peaceful. I just need to accessorise with a hot chocolate (or mulled wine… what time is it?!) pronto. And there it is. The beanie. The beanie which will be attached to my head for the foreseeable future (I’ve even been known to sleep in them… Don’t judge me, I’m from Africa and I’ve never grown used to these winters!) A coat that could double as a dressing gown, and the feet cuddles the Alpine Boots are giving me, makes the whole getting out of bed in the morning and leaving the house whilst its still pitch dark thing, a whole lot easier. I loved styling up my new TOMS boots, but best of all, I love knowing that by wearing them, someone else less fortunate than me in the world is also now walking around in a pair of shoes that they so desperately needed. It is that thought really does put a spring in my step.